I became a baseball fan way back in June of 1967. To be specific, I became a Red Sox fan in June of 1967. My fifth grade teacher brought us all to a night game at Fenway, and the Sox won in the tenth inning on what had not yet been labelled a “walk-off homerun”. It was fun, it was exhilarating, Tony Conigliaro was cute and heroic and not that much older than me. I fell in love, and I fell hard. I became a Sox fan, and that meant pain. I watched my Sox come close in ’67, then founder and drift and struggle and come close a few times again. But it wasn’t until 2004 that all of our baseball dreams came true. It felt like a miracle when they won the World Series. It felt like a dream. It felt like a once in a lifetime experience for everyone who ever loved the Boston Red Sox. My boys were young back then. Matt was 14, Tim was only 12. Kate was a freshman in college, so she wasn’t at home as we suffered through the first three ALCS games against the dreaded Yankees (“The evil empire”). But the boys were here. And they were pulled into the crazy magical thinking that went along with each of the wins of that series. I remember that I had to stop at the grocery store before game 5, and I bought Boston baked beans and Boston brown bread to go with the meatloaf that I had planned. The Sox won. We ate Boston Baked Beans and Boston Brown Bread for the next two games. And the Sox won. What I had forgotten before today was that at the beginning of the series I had made a simple ground beef dinner. My kids always had a yearning for sauteed ground beef over noodles. Whenever I was away overnight, Paul would buy a box of Hamburger Helper, and everyone was happy. Of course, being the healthy food fanatic that I am, I would gripe and complain and point out the dangers of all of those chemicals. So I had tried to come up with a healthy, no-preservatives version of “Hamburger Helper” that would make all of us happy. Apparently, I had made the dinner at some point during the baseball playoffs of 2004. I had forgotten all about that meal until today, when I thumbed through a notebook of recipes, looking for a lemon cake. 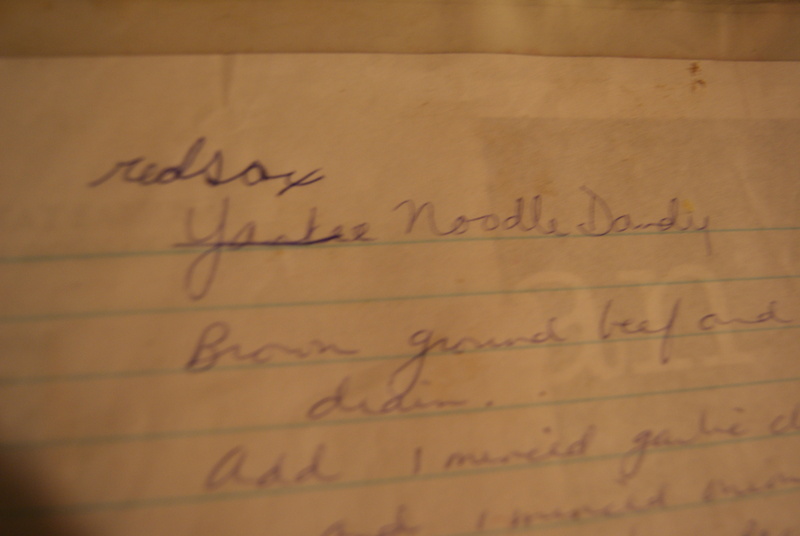 As I turned the pages, passing pancakes, shrimp, Asian meatballs and various cookies, I came to a page that was recorded in my own handwriting. It described a meal of ground beef, onions, tomato paste and spices. I had named the dish “Yankee Noodle Dandy”. But I laughed out loud when I saw the word “Yankee” crossed out, and in Tim’s youthful scrawl, the words “Red Sox” written just above. Such sweet memories, of my own childhood, and of my children’s. Such sweet memories of pulling for a team, wishing for something that is so out of our own control. Of feeling that we are part of a team, a group, a collective of hope. Did you show your son the recipe card? I stopped following baseball after the 95 strike. The strike, along with my young children, definitely pulled me back from my baseball mania for a bit. Until 2003 when we came. So. Close. Turned it off in the 6th last night…I just couldn’t watch. For once I stayed with it! So much fun! I am from the north side of Chicago, and a long-suffering Cubs fan. Watching your Red Sox gives me so much pleasure. Thanks for sharing. And I am the niece of the last surviving Cub from the 42 World Series! I pull for your Cubbies every year! It will come, and it will be FANTASTIC!